The process in the state of Kansas for certifying a nursing assistant is administered by the Kansas Department of Aging and Disability Services (KDADS) – Health Occupations Credentialing (HOC). To get certified, individuals must complete training and pass a competency test, or get training equivalency approval and then take and pass the test. Once all certification requirements are met, the person’s name is placed on the Kansas Nurse Aide Registry. In the following sections, the requirements to become a Certified Nurse Aide (CNA) in Kansas are explained, beginning with a description of the state-approved routes through certification renewal. There are several steps an individual can follow to become a Certified Nurse Aide in Kansas. A new nurse aide will complete training at a state-approved facility and then take a multiple-choice exam. Some individuals can qualify for recognition of past training as being equivalent nurse aide training and request to only take the CNA test. A new Certified Nurse Aide in Kansas completes a state-approved 90-hour training course at a state or private funded educational facility. A nurse aide enrolled in a training program is initially called a Nurse Aide Trainee I. After completing part 1 of a two-part training program, the person is designated as a Nurse Aide Trainee II by HOC and can work with residents while under supervision. The 90 training hours include 45 hours of clinical training. All nurse aide trainees and CNAs work under the direction of their supervising LPN or RN. Another option is to complete CNA training at an adult care facility while employed. Kansas defines adult care facilities as including long-term care facilities, nursing homes and long-term units of hospitals. The individual can work for 120 days without certification, but Kansas requires getting a Nurse Aide Trainee II approval from HOC before working directly with residents. To get approval, the nurse aide trainee must complete part 1 of the training program and a competency evaluation checklist before providing hands-on resident care services. 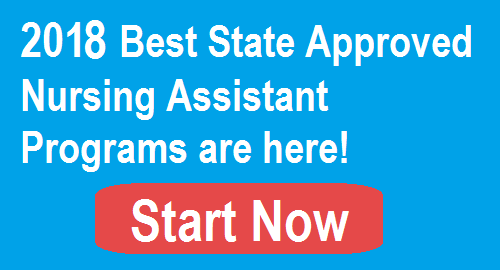 Out of state Certified Nursing Assistants who are in good standing on their state’s Nurse Aide Registry, and want to earn certification in Kansas, can challenge the Kansas Nurse Aide Test one time. Challenging the test means the out of state CNA wants to take the test without additional training. The CNA from another state can get permission from HOC to work at a long-term care facility as a Nurse Aide Trainee II for 120 days while waiting to test. The individual must have an “Approval to Test” letter from HOC and must successfully pass the exam within the 120 days. Nursing students (RNs and LPNs) and mental health technicians who can provide verification they completed basic nursing skills courses, and a minimum 45 hours of clinical training that included geriatric training while enrolled in a state-recognized training program in any state, can request to bypass nurse aide training and take the CNA state exam. Training must have been completed within the 24 months prior to application. The person gets one attempt. A Registered Nurse (RN) or Licensed Practical Nurse (LPN) in any state and with an active license can also apply to take the exam without additional training. The individual gets one attempt to pass the test within 12 months. Other people who can apply for training equivalency and request to take the examination without additional training include the RN, LPN or Licensed Mental Health Technician who have a license that expired in the 24 months prior to application. Out of state CNAs, nursing students, graduate nurses, RNs, LPNs and Licensed Mental Health Technician whose training is endorsed by the state as equivalent to CNA training get one attempt to pass the CNA exam. If unable to pass, these individuals must complete a state-approved CNA training program and will get two more attempts to pass the exam. The 12-month period begins on the training course’s beginning date. Kansas will consider any application for equivalency if the person has completed training or passed a test, or both, if the training and test are similar to the training and test that Kansas requires for Certified Nurse Aides. Military people trained in healthcare and foreign trained nurses should contact the Kansas Department for Aging and Disability Services to discuss potential training equivalency. A new CNA, and others required to train based on their circumstances, will need to complete state-approved training and pass the state CNA test. CNA programs in Kansas are offered at community colleges, nursing colleges, technical schools, career institutes and adult care facilities. Individuals should only choose a state-approved training program because it has been evaluated to ensure it meets federal and state training requirements. There are 29 state-approved Certified Nurse Aide programs in Kansas. You can find the best local CNA school in the following list. The school list is updated in November 2017. Kansas City Delores Homes Training Centerm, Inc. The Kansas City Kansas Community College (KCKCC) enrolls high school seniors in its program. The training program is one-semester in duration and classes are offered on-campus. It is a credit program, meaning the student can apply the five (5) credits towards a degree program at a later time. Midwestern College offers on-campus CNA classes and CNA hybrid courses, meaning some classes are attended online and others are attended on campus. It also takes a semester to complete. The on-campus weekday class that requires full-time attendance takes approximately four weeks to complete. The CNA hybrid course, with Saturday only attendance, takes approximately eight weeks. Washburn Tech offers a CNA training program that is 106 hours of instruction and accepts high school juniors and seniors, and post-secondary students. It is a five-credit course, and credits can be applied to a future degree program. The costs of training also vary for CNA classes in Kansas. KCKCC charges $86 plus a per-credit fee, tech fee and allied health special fee for a total of $331. The student must still buy uniforms and cover other expenses. Washburn Tech’s CNA program for high school students costs $164 for tuition, materials and technology fee, textbook, supplies and a certification fee. The program costs for post-secondary students are $794. Midwestern College charges $550 for tuition, textbook and testing fees. All students, no matter where they attend, will have to buy uniforms. All the amounts mentioned are subject to change by the training facility. Generally, the cost of training can run from $500 to $1,000. Students should discuss payment options and potential funding sources with the school’s financial aid office. Some students may qualify for workforce training funds, and the financial aid office can direct them to the appropriate state agencies. Federal law requires employers in Medicare/Medicaid facilities to pay for all training costs for students who train in their facility. The free training applies to employed student nurse aides and people who have received an offer of employment from the facility on the date training began. If a Medicare/Medicaid facility makes an offer of employment within 12 months of the student completing any state-approved training program, the state, through the employer, will pay the training costs on a prorated basis. A state-approved CNA course in Kansas is a minimum of 90 hours which includes classroom, lab and clinical training. The program has two parts, and each part is required to consist of 50 percent clinical training that can take place in an adult care facility, school setting or simulated laboratory. The Kansas state exam consists of a Written Test that consists of 100 multiple-choice questions, and a minimum score of 75 percent is a passing grade. Testing individuals are allowed three attempts within 12 months. The 12-month period begins on the first day the training program began. If the individual does not pass the test within 12 months, he or she must retrain and retest. After successfully meeting state CNA certification requirements, the individual’s name is added to the Kansas CNA Registry. Once on the Registry, the person can use the CNA designation and accept jobs that require certification. The checklist process involves a RN watching the nurse aide perform 18 skills to determine if the individual can perform the skills in a satisfactory manner. The HOC maintains a list of state-approved training sites offering a CNA refresher course. There are 7 state-approved Certified Nurse Aide refresher programs in Kansas. The program list is updated in November 2017.